We had a very nice day. My mom brought Corn pudding, squash casserole, cheese sauce, Kibi, chocolate cupcakes and Hubby made mashed potatoes, giblet gravy, stuffing and rolls. I made pecan and chess pies. Yum! We are stuffed little piggies! Hubby usually makes the turkey but this year the guys picked up a turkey from Popeyes. It was SO tender! Hubby can cook a fabulous, tasty turkey, but I must admit this Popeye turkey was REALLY good! 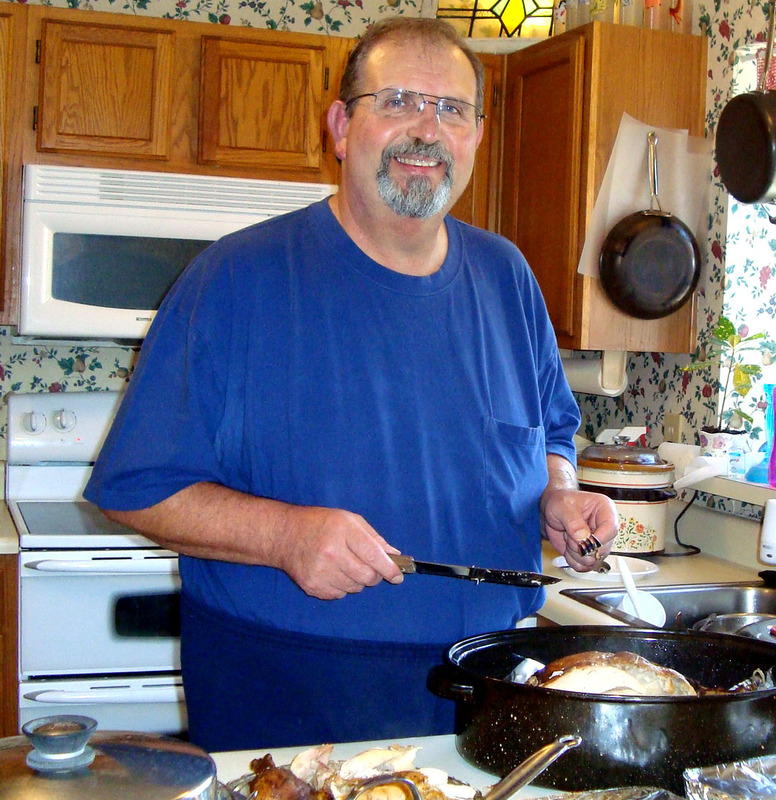 Hubby worked hard in the kitchen all morning….he is amazing! 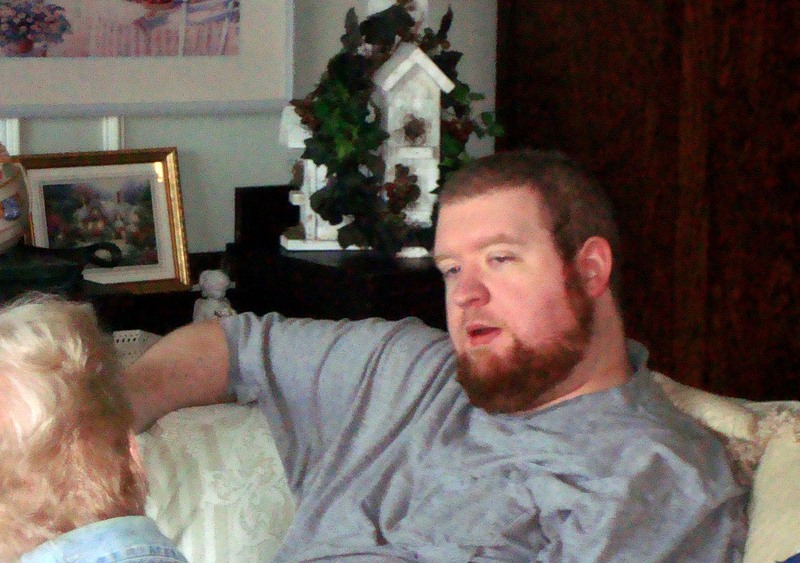 My younger son telling G’mom how things work at his work…on call for the Holidays, cause he is low man on the totem pole. 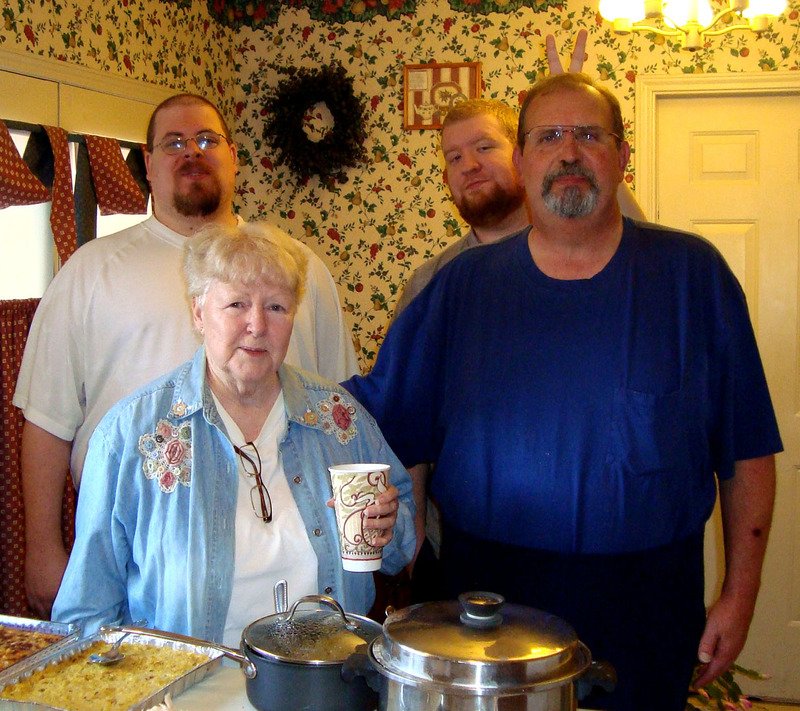 Notice the little two fingers behind daddy’s head? 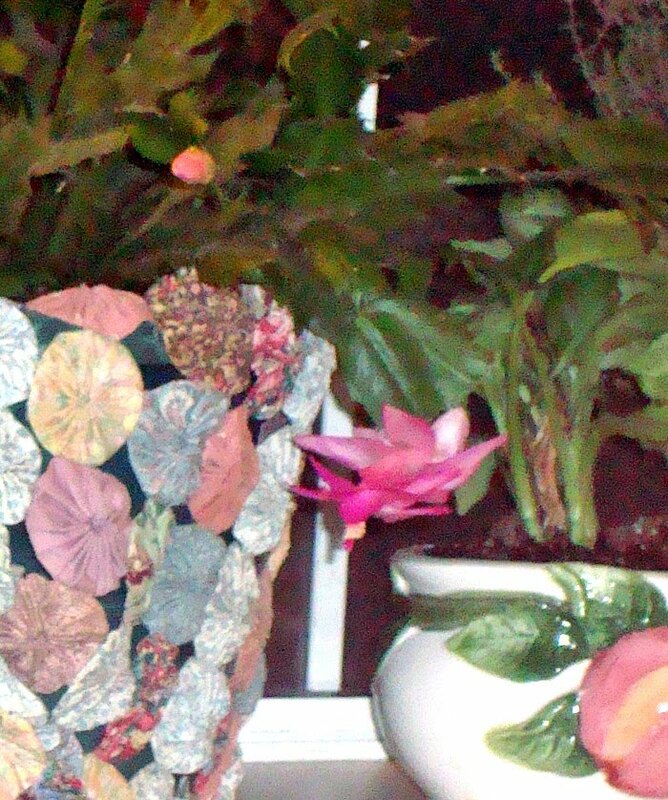 My Christmas Cactus was in full bloom and I decorated the table with Fall leaves and candles. 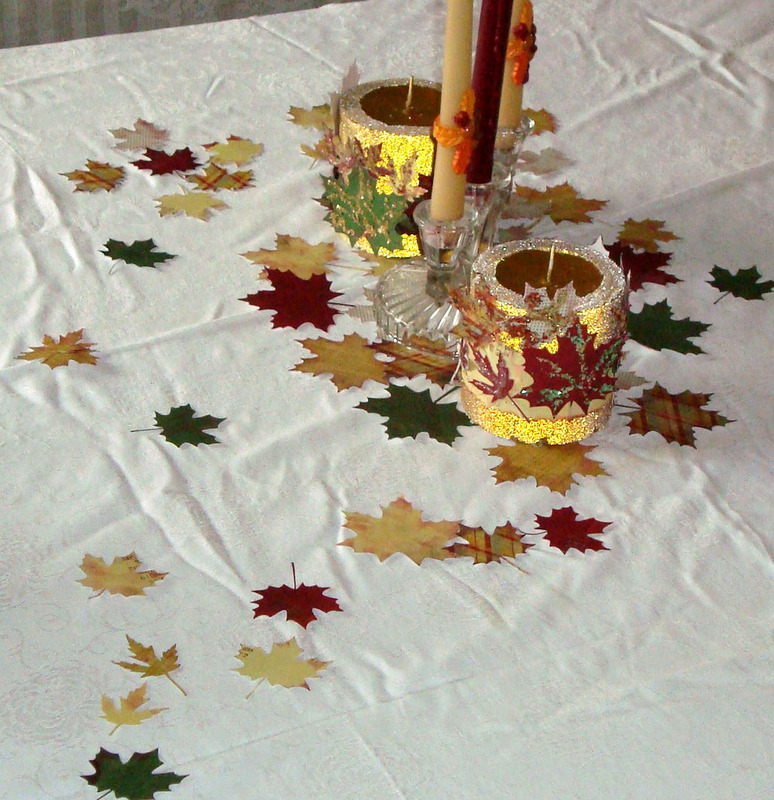 Could not find my Fall table cloth so I cut out some different sizes of Fall leaves and scattered them across the table…it was quicker than sewing up a table runner. 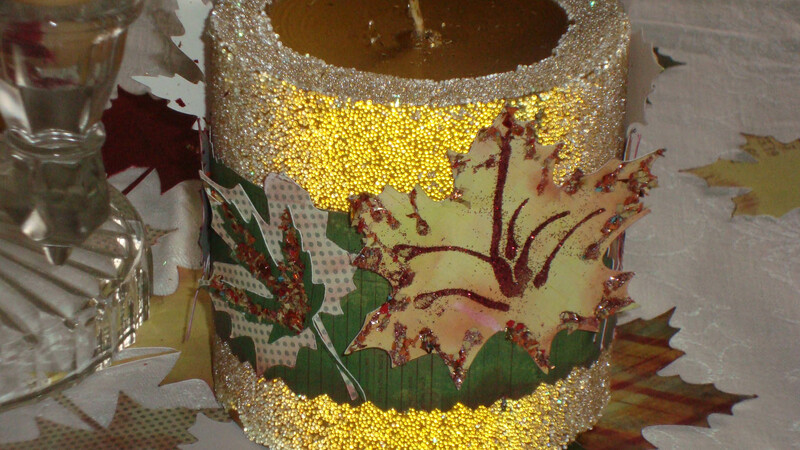 And then I decorated some gold glitter candles with leaves and more glitter all glued to a belly band. 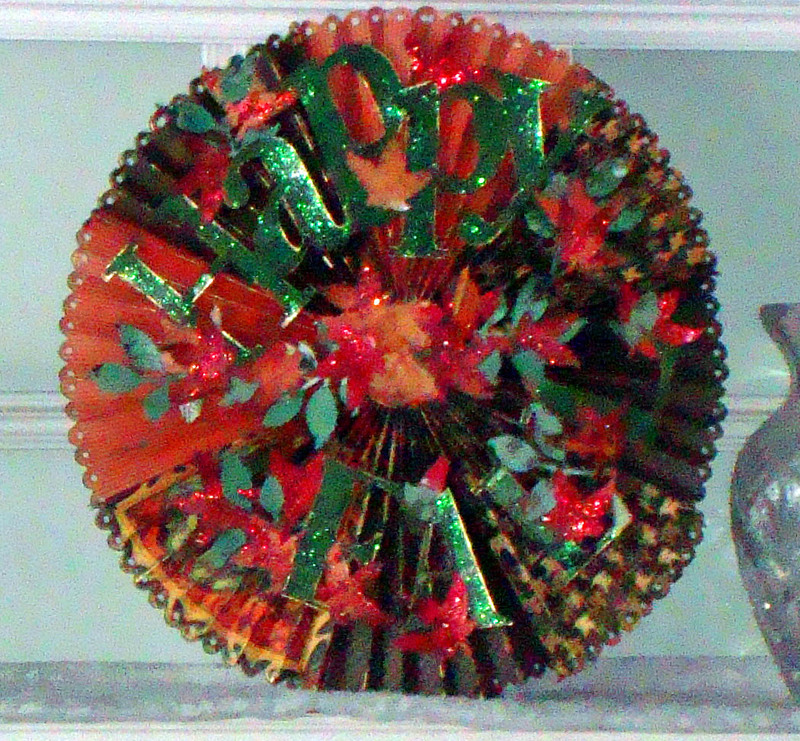 Earlier I made a wreath that says Happy Fall…added glitter and before I new it glitter was all over it…LOL! 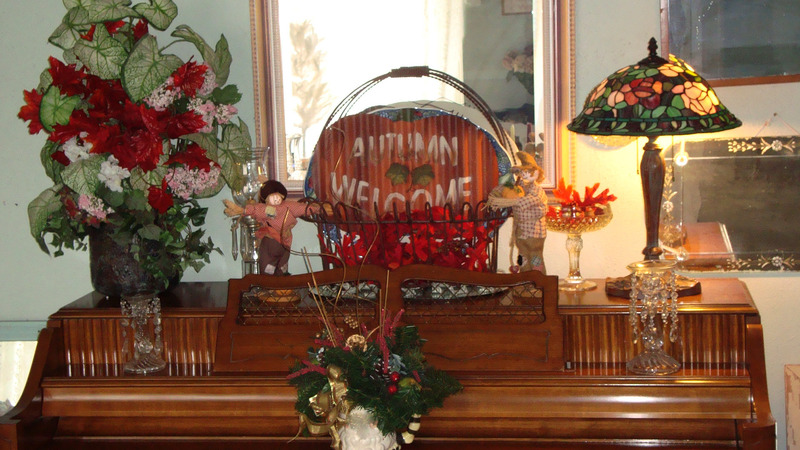 Tomorrow, we’ll decorate for Christmas! But for now, I’m going back for some yummy left overs. I made a Flower Pot card for my MIL. It was so fun to make! Rather than taking photos, I made a video. Give it a look, just click the link below. Have a great weekend! When you hear the term ‘Old School’ what do you think of? Makes me think of fast GAS drinking cars, computer absentee cards and walking through my dad’s office and seeing piles of huge, heavy ledger books from his accounting business. The old typewrite was there on his humongous desk with pull out work areas. My mom could make that typewriter sing! and she could also work the ‘comptometer’, a beastly looking adding machine contraption. And when she would help dad balance the books the adding machine would run non-stop as Mom’s fingers skillfully ran over the numbers. I don’t think she every looked up while she was punching on it. She knew exactly where all those numbers were. And right outside his office was the niche where the phone was. 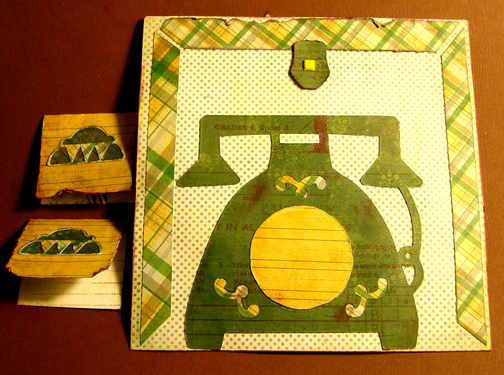 And a little shelf for the phone book. But we were very modern and had the ‘new’ touch tone phones and plugs that we could carry around the house to different rooms. I had a phone in my room too! No more phone in the hall hard wired to the wall. I had a stereo with headphones so huge my mother promised I’d be deaf one day and stuffed in the bottom of my basket were library books she didn’t want me to read…I was to be studying and making As. I was threatened with a Prep School if my B and C grades didn’t improve. 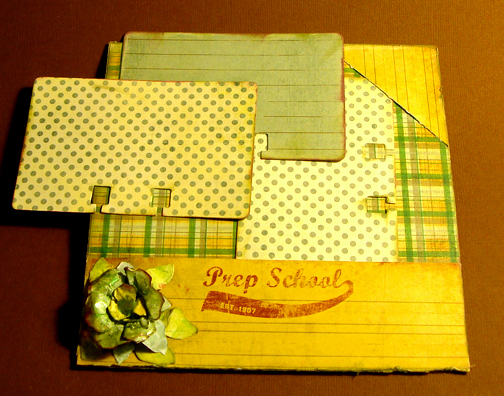 I LOVED the idea of prep school! As it turned out I made it into a ritzy little college on the strength of my SAT score. That pleased the parents and now I scrapbook for a living…lol! So when I saw the Pink Paislee ‘Old School’ collection, I HAD to have it!! 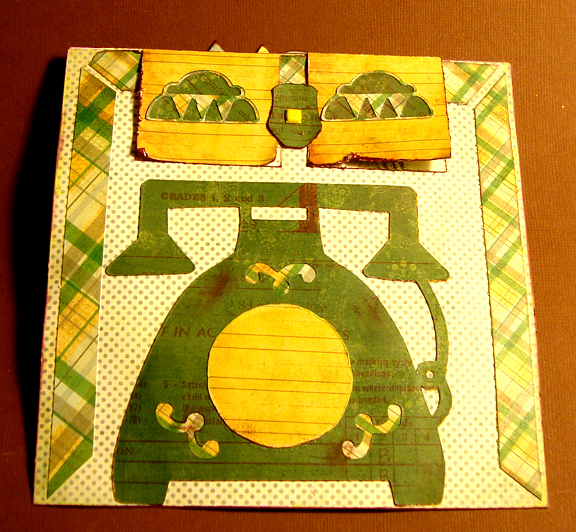 It would be perfect with my Rolodex card and Vintage phone die cuts and pennants waving from each page! 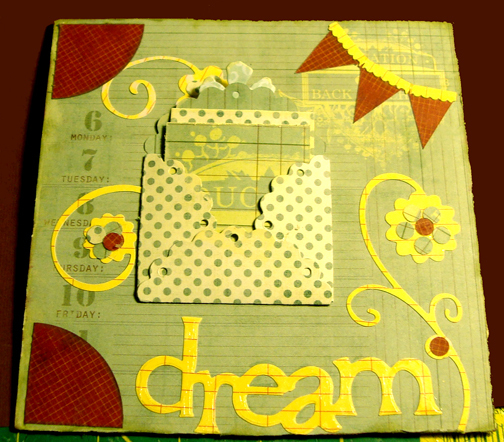 More pennants, The large circles are for more photos or journaling and the Tim Holtz Ornate frames are slipped into their own pocket and can be for photos, memories and once they are removed, there is another circle for another photo or journaling. Don't you love those flourishes? And the pennants? 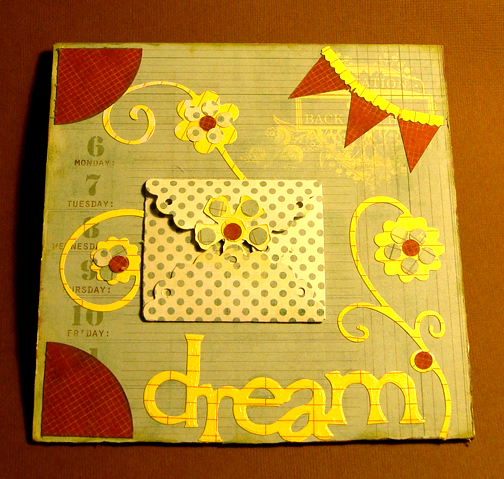 The envelope in the center of the page has little squares where I wrote my dreams, then I closed the top and slip it under the flower to hold it down. Doesn't this look like it was pulled out of an attic? What are your memories from Back in the Day? 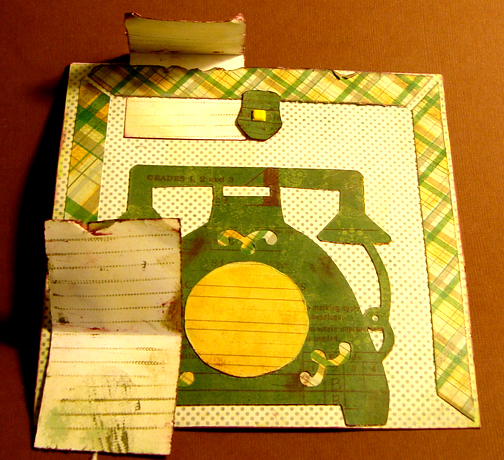 And started a collage with KandCompany paper, then stamped, sanded and inked all around the edges with a little extra distressing in places. Took my little Cricut and cut a few clouds and other scalloped items as a background to frame photos and glued them in the center of the plaque. Then I began working on the Roses and Leaves. It was tedious but I LOVED doing this! 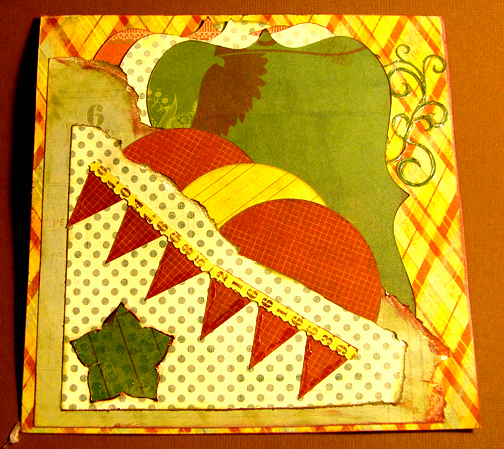 I used water color pencils to paint the white cardstock leaves and brushed the leaves with Pearl X and medium. Once the Roses and Leaves were placed and I was happy with the colors, I added Stickles and Glitter Glue and more Pearl X. From there, I glued the small scallops to the bottom of the area to be used for holding the photos in place without falling. 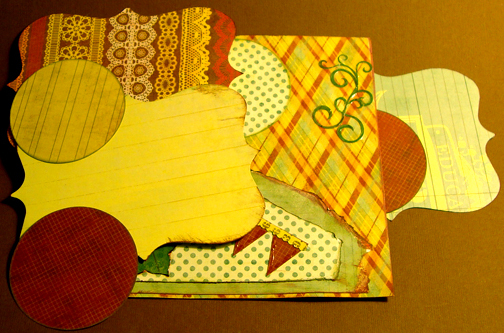 The Photos slide right behind them, as they are only glued at the lower edge of the scallop. The Roses and Leaves are 3-D so it’s easy to slip a corner behind a leave or petal without having to cut or overly crop a photo. This way, I can change the photos around when the mood hits for something new. Here’s the video of the re-purposed plaque and what it looks like now. My Mother-In-Law came, which is very rare, and my mom. Hubby picked them up and we had lunch, a small gift exchange, some laughs and pleasant conversation around the fireplace. It felt good, like it should be, like family and love. I wanted to bottle it. Good memories! The moms were dressed so nicely. My mom is a thrift store addict and always looks nice, like she shops high end stores. My Mom In Law wore the cutest sweater! She always selects the nicest outfits. Her sweater was black and had Christmas candy cane stripes and resin buttons of snowmen, candy canes, etc. She looked adorable. Hubby cooked his amazingly tender turkey and mashed potatoes and gravy. Mom brought her squash casserole, corn pudding, cheese sauce and kibi. 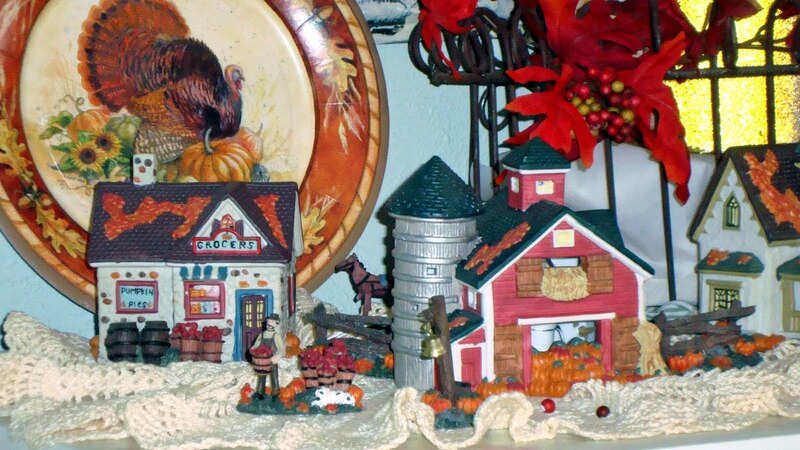 With a few additions and pies we were stuffed piggies and the food dishes looked barely touched. My two boys, still home in college, are such a blessing. They are humorous and love picking at me, joking around and laughing. They are so precious and let me hug them, kisses are limited still, they are men after all. 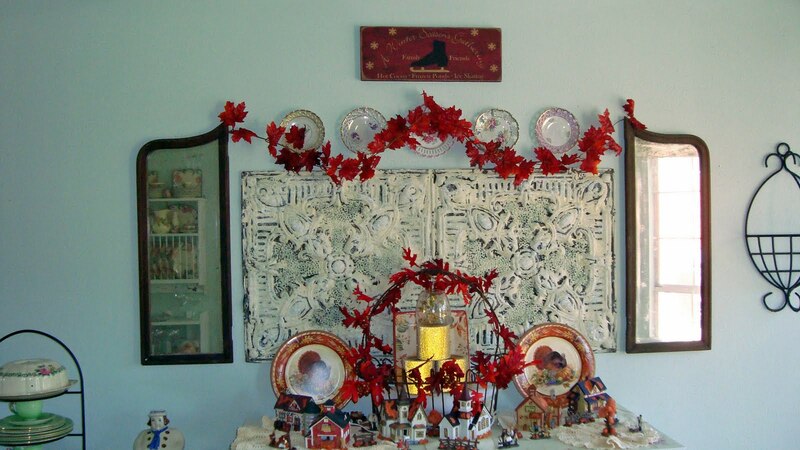 My best gift, besides having my boys still home and the Moms together on Christmas Day, was the complements on my decorating and MIL insisting my roses were good enough to be in a gallery. So sweet and appreciated. Times like these totally reinforce to me how amazingly blessed I am. A hubby who cares about me and has for 30+ years and the list goes on and on. Christmas Day was relaxing and VERY special. 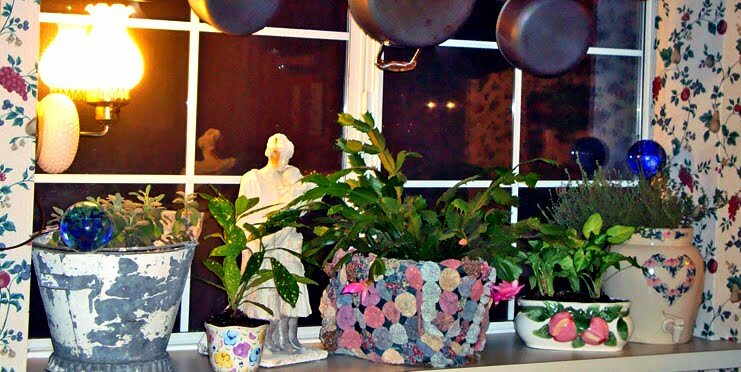 Don’t you love plants in a Kitchen window…and Christmas Cactus in bloom? Coffee/Tea, a small kitchen garden…a lovely start to the day. Are you having those beautiful Fall mornings? Are the leaves turning beautiful shades where you live? Our first nice cool morning was Friday and today there was actually frost on the roof tops! So exciting to finally wave those upper 80 temperatures goodbye for a few months! Hubby and I ran errands and ended up at Michael’s. 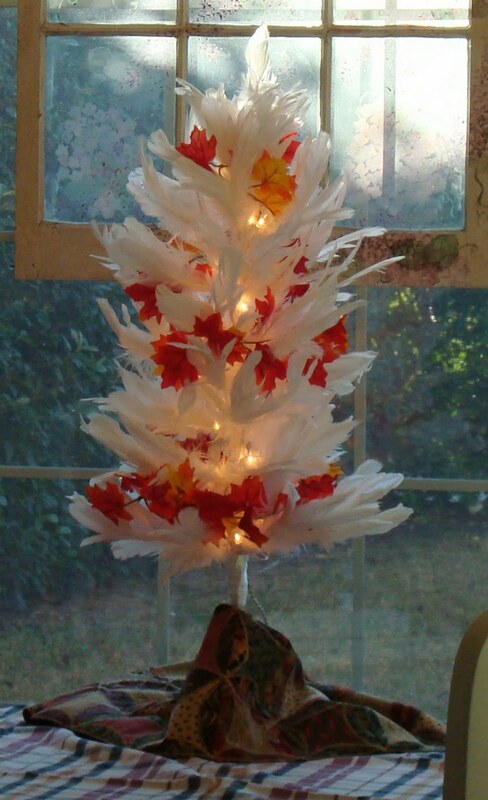 We went in for glue and came out with a precious Feather Tree! 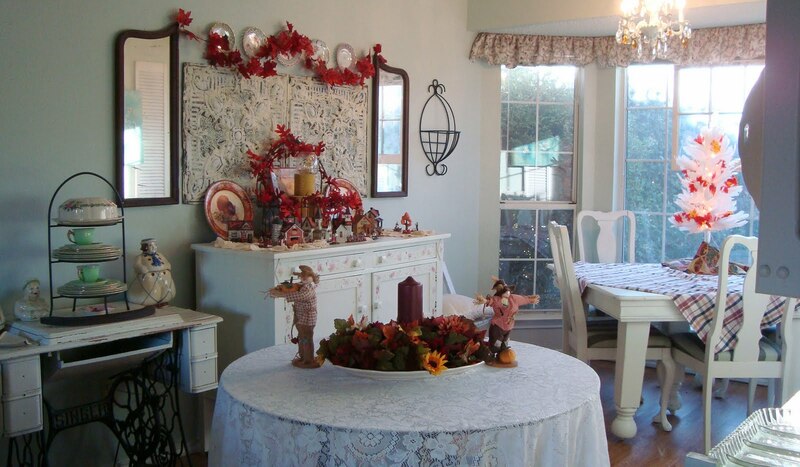 Usually the first table is against the wall and holds desserts and such but Hubby liked the idea of it pulled out into the room. 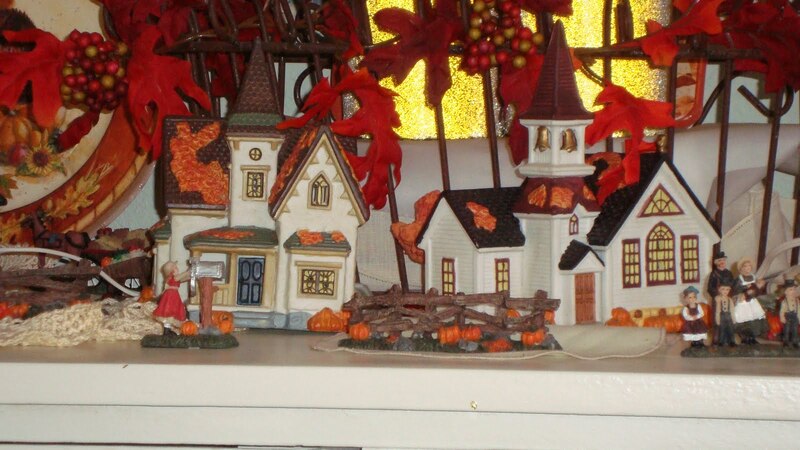 This is the first year I have used the Fall houses and I love them! 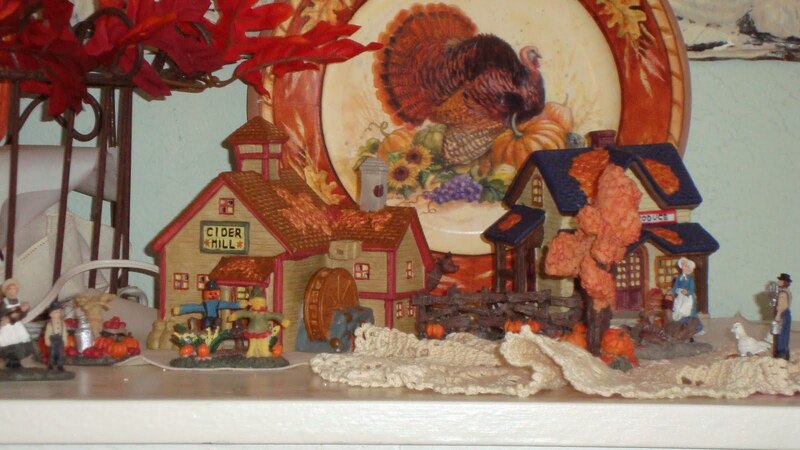 There is a church in the center and a house, the others are a cider mill, pumpkin patch and grocery store. I can see where collecting houses can get way out of hand! Who can avoid buying just One More? The mirrors are so very old and weather’d but I love ’em. and the Cider Mill and Produce stand…we don’t have many of these in Texas but Starbucks has an awesome pumpkin latte. I suppose we grab those Blissful moments however we can, where we can…then hold them dear. Hubby saw it before I did. He is just that amazing. 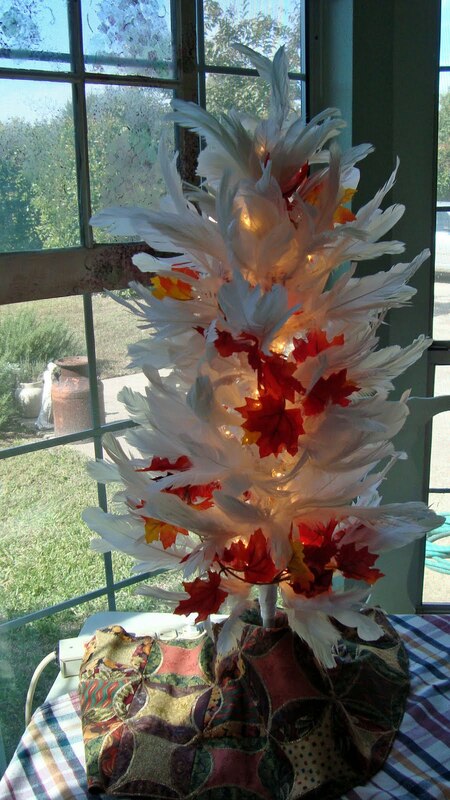 So he decided I need a white feather tree for my Birthday. 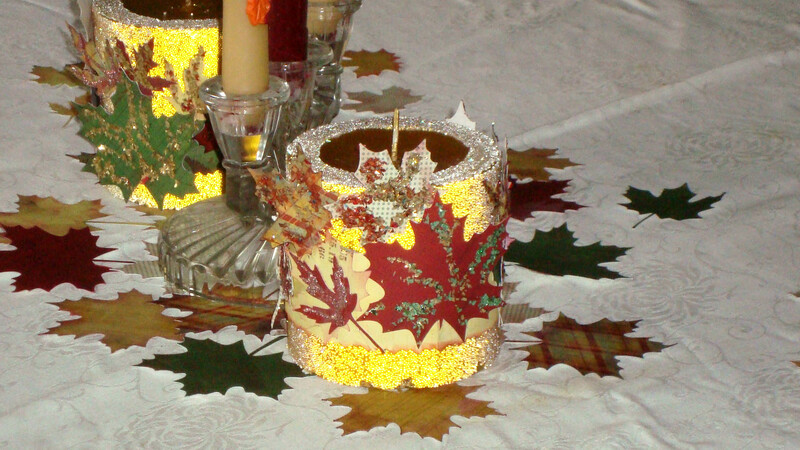 No way was I going to say no…I love the way it looks with the fall leaves woven throughout. Think I’ll leave this up year around and change it out with the different holidays. 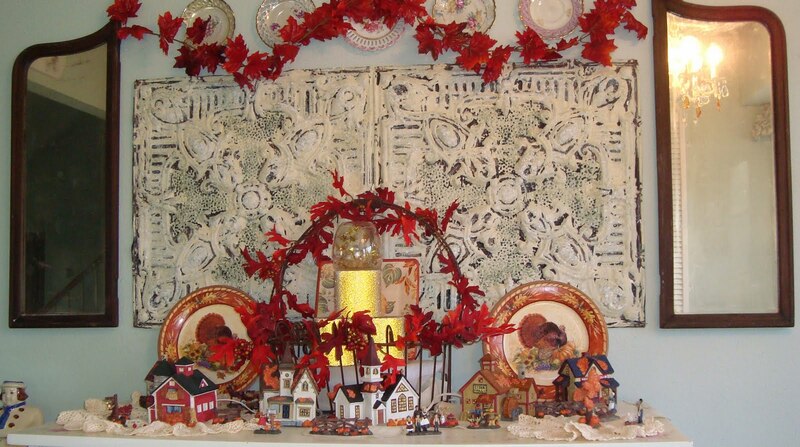 And one day, maybe my little grandkids will step up to my grandmothers sideboard, now painted white, and will play with the little people and animals in the scene and wonder about them. Soon as I hit the publish button I realized I hadn’t hung up my sign that JenniferB made. 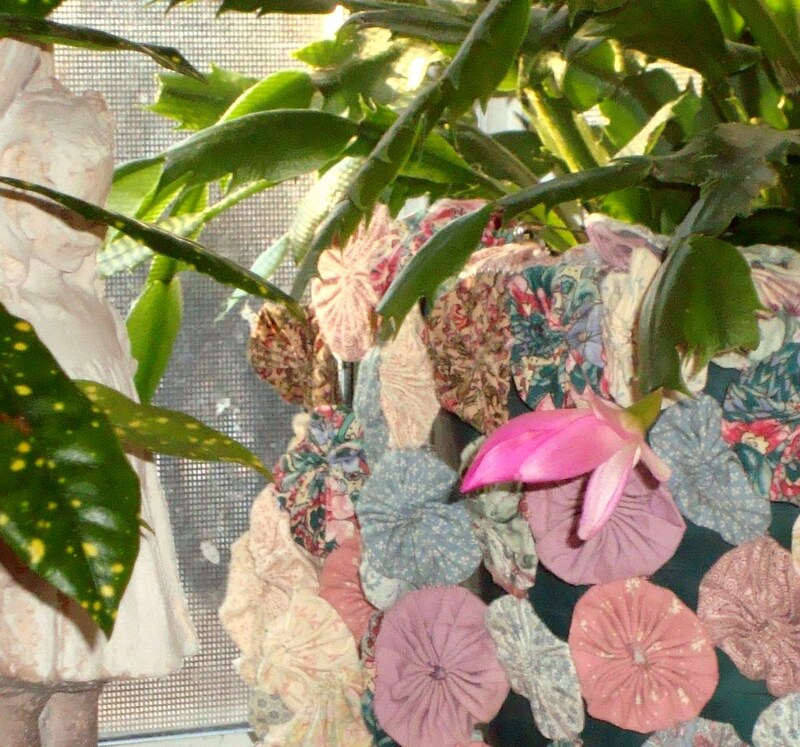 AND….since I didn’t get a good photo of the little ‘tree skirt’ wrapped around the feather tree, I had to retake that photo, too. Made it last year from a pattern mimicking a Cathedral Window quilt. Have it on Etsy, reworked so it doesn’t pucker in the middle and boy does it go together fast! Enlarge that photo with the sign, I love the way she did it. She needs a blog…I’ll run tell her…be back soon.